It's never too early for Christmas cards! Challenge Team Member Jill Dewey Hawkins spotted Vika's cutie pie card using the Jingle All the Way stamp set as an entry for our Wednesday Sketch Challenge #239. Jill says that this card is "fun, unique, and well done!" Vika wants to know if you've started your wish list yet. We hope it's filled with lots of fun products from My Favorite Things! Contributing Team Member Inge Groot has high praise for Michelle's card! She says, "Michelle always makes the most beautiful clean and simple cards, and her coloring rocks!" 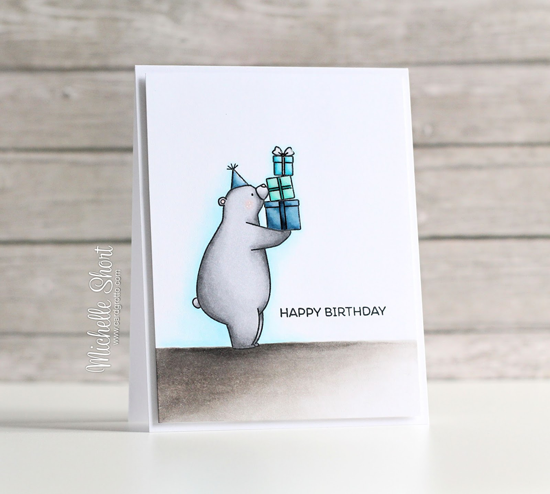 By keeping the color scheme somewhat muted and simple, Michelle achieves a sweet card using the Birthday Bears stamp set that could even work for a man. Design Team member Francine Vuillème and I spotted this amazingness from Kristin (@eveolith) on Instagram. 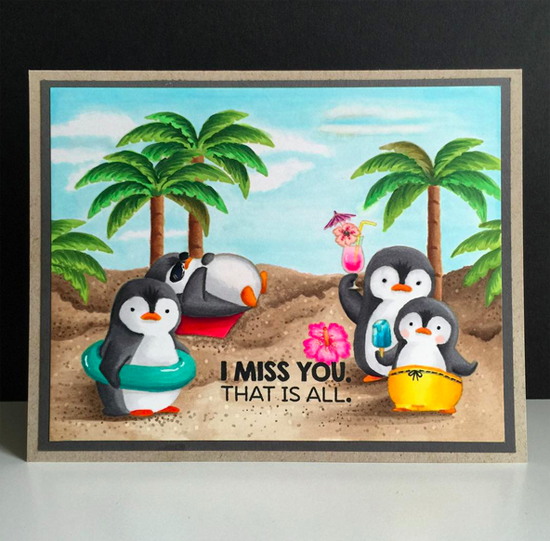 Francine says, "I LOVE the scene Kristin created with the Penguins in Paradise set and her coloring is breathtaking!" These little dudes sure have been enjoying the summer of 2015, don't you agree? Design Team member Yoonsun Hur and I found this glorious card on Instagram. 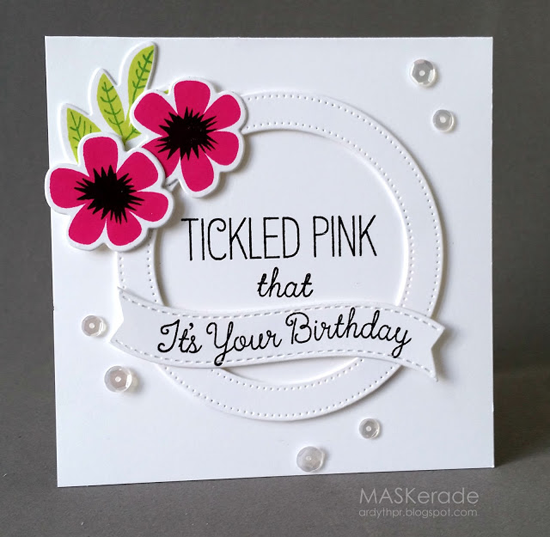 Diane followed Sketch 241 to create this delightful birthday card. Yoonsun says that it is, "So neat and pretty!" I'm particulary drawn to the festive patterns and the touch of gold for the sentiment. 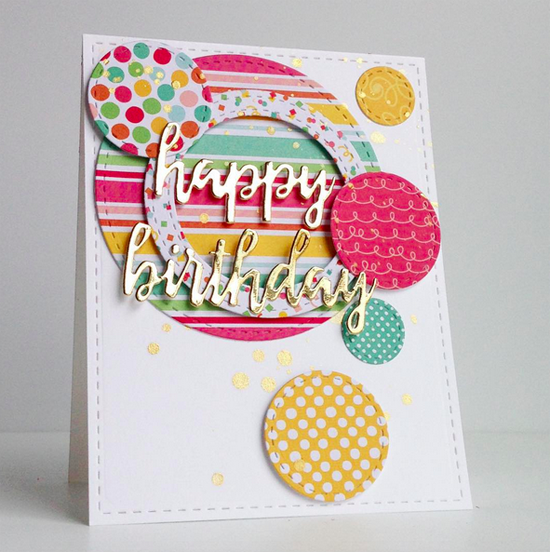 Design Team Member Kay Miller and Challenge Team member Jill Dewey Hawkins both raved about this super pretty card by Ardyth. Kay says, "The white on white with the pop of color from the bright pink flower is just brilliant!!" and Jill complies. "The crisp white of this card by Ardyth, with the POP of bright pink and green with all the die cuts: Dynamite!" See you tomorrow for the next Sketch Challenge, and look for a new MFT Color Challenge this Thursday, August 27th! Thanks so much! Very exciting to see my card amongst all these other gorgeous cards! Definitely some card crafting eye candy! Great job everyone. These are all so wonderful and amazing! Thank you for spotting my card!!!! Wow!! !